My that's a lot of acronyms. REPL means "Read Evaluate Print Loop." You know how you can run "python" and then just type 2+2 and get answer? That's a type of REPL. The ASP.NET Core team is building a REPL that lets you explore and interact with your RESTful services. Ideally your services will have Swagger/OpenAPI available that describes the service. Right now this Http-REPL is just being developed and they're aiming to release it as a .NET Core Global Tool in .NET Core 2.2. Then run it with "dotnet httprepl." I'd like another name? What do you think? RESTy? POSTr? API Test? API View? Here's an example run where I start up a Web API. Take a moment and read that. It can be a little confusing. It's not HTTPie, it's not Curl, but it's also not PostMan. it's something that you run and stay running if you're a command line person and enjoy that space. It's as if you "cd (change directory)" and "mount" a disk into your Web API. You'll want to set a default Content-Type Header for your session. I think this should be default. I'm really enjoy this idea. I'm curious how you find it and how you'd see it being used. Sound off in the comments. It might be a better fit as a PowerShell Provider. It's a cool experiment but I feel like it's more shell/navigation than REPL. It's as if you "cd (change directory)" and "mount" a disk into your Web API. This is great, but I must admit I had the same thought as Travis. 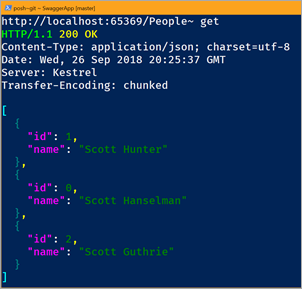 I often use Invoke-RestMethod in PowerShell for exploring REST APIs but this article made me think how cool it would be to have a proper PowerShell Provider for it as well. I tried using VS Code from the command line. A PowerShell provider allows any data store to be exposed like a file system as if it were a mounted drive. In other words, the data in your data store can be treated like files and directories so that a user can navigate data via cd or dir. SHiPS is a PowerShell provider. To be more precise it's a provider utility that simplifies developing PowerShell providers. I'm not advocating to go with one or the other, but I did find it interesting and thought it would be advantageous for the two teams to work together on the Http REPL. then you could list out the rel links and follow them. You could do things like "self", "next", "prev", "first", "last" and navigate automatically. Ever heard of https://github.com/eliangcs/http-prompt in Python?